Hello, Fabricworms! It's been quite a while since we've had a giveaway and it's about time for a fantastic one! 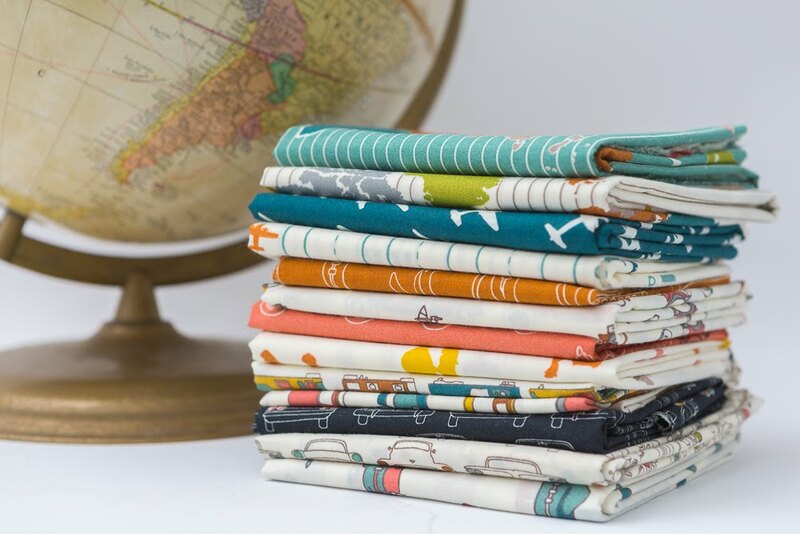 As many of you know, Birch Organic Fabrics is about to release their latest collection, Trans-Pacific, later this month. To celebrate its release, we will be giving away a free fat quarter bundle before the collection has even released! Say it ain't so! Enter into the giveaway for a chance to win! This giveaway ends on Sunday 3/12 @11 PM PST. The winner will be contacted shortly after by email. The winner will be chosen randomly by Gleam. A travel bag of some sort! Love, love, love!! I would love to use this for a new quilt! My daughter is an international business major, could be fun! This is one of the cutest Birch Bundles yet. This is such a great fabric line! Thank you for the chance to win this bundle. Would love to make a quilt celebrating my native California!! This would make the cutest baby blanket!! I'd probably use it for an eclectic stuffed animal, or incorporate it into my embroidery. My GGS would love a quilt out of this fabric. This beautiful fabric would make an awesome baby quilt! These fabrics would make lovely travel zippered bags of various sizes. I'd make a beautiful baby play mat! I'm thinking a lucky baby would love a quilt in these fabrics! Thanks for the chance to win! Beautiful! I love the line! I have six grandsons, one of them would get a lap quilt for their birthday. In my world, it's always quilts!! I would make a quilt for my four year old! What a beautiful fabric bundle giveaway! Love your fabric collections! Posted under Zosha instead of Sophia DeLonghi. I would make an awesome quilt!! I would love to design a wall hanging with these fabrics. Pretty darn cute I would say. I would make pillowcases for some special guys. Beautiful fabric. I would make a quilt for sure. We are a family of expats so it's right up our street! For some reason the counter thing doesn't count my entries. I tried most of the options, but it always says I have 0 entries... it used to work in the past, so I don't know what the problem is. I have a baby quilt to make for a little boy expected next month. I would make a table topper and napkins with Trans Pacific. THink of all the great conversations it would invoke. My grandson would adore a quilt made from this collection. I really like the fabrics. My favourite is the one with the camera's on it. I think the first thing I would make out of it, is a pouch to keep my camera lenses safe. 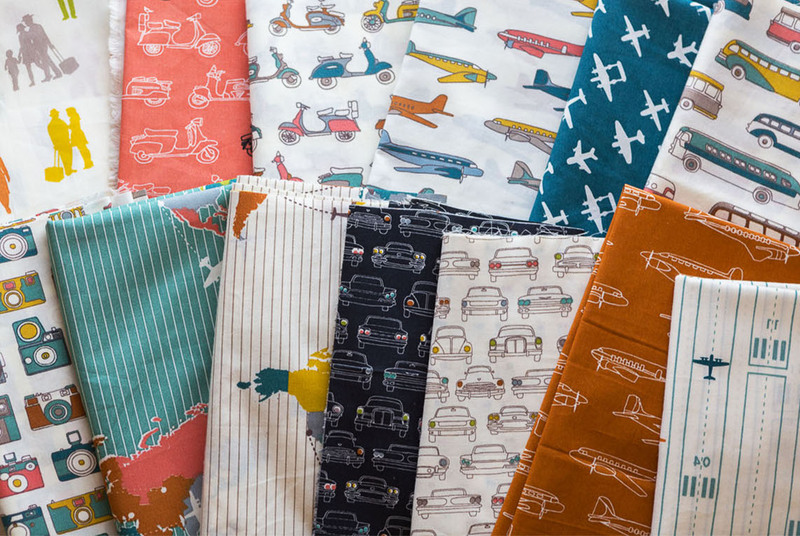 These fabrics would be perfect in a quilt for my son who loves to travel. Love Birch Fabrics, thanks for the giveaway! Pick me pick me! A beautiful quilt! Such cute fabric for travel packs for the kids and covers for our passports! I would make a tote bag or a quilt. Maybe both! Quilt for my grandson who loves all vehicles! I love this collection! I would made great summer outfits for my baby!! I love these fabrics and they would make an adorable baby quilt, or kids aprons, or cushion covers!! Thanks for the chance!! Beautiful fabrics. As a frequent traveler, I especially enjoy these! I like the modern feel of these! Great idea for a throw quilt I've been wanting to make for our "travel" room. Since we're redoing it, maybe I'll use the colors as inspiration for the entire room! A lap quilt for our guestroom. A quilt for a hoped-for baby. A quilt or some zippered pouches to hold toys and supplies for my sons when we're traveling. Thanks for the chance to win. I would love to use them on a back of my boys' tshirt quilt that is all plane's, trains, automobiles! I would like to make a set of baby items: burp cloths, changing pad, wipes holder. I love the giveaways! So inspiring and exciting! Thanks! Mopeds in coral is my favorite TP knit. So cute!